"We are protecting our dead from you people! If it is God's wish to destroy us with our own kind, then so be it!" When one hears the words “home-made” and “low budget” associated with horror films, the worst is usually expected. Some films, however, break the mold of the poorly acted and incompetently directed horror flicks by rising above their origins to become a sort of cult phenomenon. The Dead Next Door is such a film. Essentially a labor of love for director J.R. Bookwalter, the film was produced off and on over a period of four years, and the result is a satisfying slice of independent horror pie. The film has also no doubt gained some notoriety over the years do to Sam Raimi’s role as the film’s executive producer (billed here as “The Master Cylinder”), and for good reason: while this is an independent film shot on Super 8, it’s probably one of the most expensive films of this kind ever produced. Appropriately enough, the film opens with a Raimi-esque zoom into a small room where we find a man and his daughter huddled in fear. It soon becomes apparent that the man has managed to re-animate the dead; the scene then shifts to Akron, Ohio, where a zombie invasion breaks out in the middle of a mom and pop video store (which coincidentally shares its name with a store that once operated in my hometown). This scene immediately signaled that I was in good hands with this flick, as one of the undead takes a copy of Dawn of the Dead to the counter with a stack of other tapes before the unsuspecting clerk figures out what’s going on. Wicked. The scene then shifts to a few years later in Virginia, where we learn that the zombie outbreak has spread and has left mankind in a constant struggle for survival. The film focuses especially on the Zombie Squad, an elite tactical team created especially for destroying the undead. The film’s main narrative opens with a team dispatching some zombies in a delightfully gruesome fashion; unfortunately, one of the guys gets bitten by one of the zombie’s decapitated head, which confirms what we already assume when we deal with any zombie film: any bite from the undead is lethal, as there is no known cure for the zombie virus. The film then focuses on finding such a cure, as the Zombie Squad returns to the source of the outbreak, Akron Ohio, where they attempt to retrieve the notes of the scientist who started the outbreak. It’s at this point where The Dead Next Door takes a unique turn, as it soon becomes apparent that zombies won’t be the squad’s only threat when the soldiers stumble upon a religious cult dedicated to the continued survival of the undead. The cult even goes so far as to sacrifice the living to appease the hunger of the dead, and they are opposed to the Zombie Squad’s annihilation of the dead. The cult, led by Reverend Jones, believes that the undead takeover is God’s will and will stop at nothing to protect the dead, which leaves the squad battling both as they race against time to find a cure. If you’re getting a Romero vibe from this plot description, it’s because the film very much resembles Romero’s treatment of the genre he helped create. The fact that the humans from the cult are more threatening than the zombies especially resembles the aforementioned Dawn on of the Dead. The film’s religious angle also adds a dimension to the film that helps it to rise above your typical zombie flick. Many horror fans will tell you that we have to sit through an inordinate amount of films that seem to rip each other off at times, so it’s always nice when a film like The Dead Next Door rolls around to shake up the formula a bit. While it’s certainly not the most original film in the world, it has a bit of a different take on the zombie genre. Of course, if you haven’t seen this, you’re probably wondering how good this can actually be given its low budget origins. I’d be a fool if I said the film doesn’t betray those roots at several times during the film, but, for the most part, this film is surprisingly good. The biggest weakness is its acting, which is pretty atrocious at times; furthermore, it doesn’t help that the characters’ lines are dubbed on top of that, as it makes several of the characters sound like they’re reading from a script (this is especially true of Dr. Moulsson). I should also note that Bruce Campbell provides the voice of two characters, so if you hear the familiar voice of The Chin, don’t be alarmed. The film also has some poorly shot and edited sequences; for the most part, however, the film is competent enough. Also, there are two things to keep in mind here: this was Bookwalter’s first directorial effort, and he was only 19 years old at the time, so the film is bound to reflect such inexperience. What the film lacks in technical brilliance, it makes up for with its sheer ambition and enthusiasm for the genre. The film is essentially a fan-film that’s financially backed by one of the masters of horror to which the film pays tribute. As such, we find many of the characters’ names to be tributes to not only Raimi, but other horror legends as well, as we find characters named Carpenter, King, Savini, and Romero. It’s pretty obvious that this film was a labor of love more than anything, as all of the cast and crew worked for free on the film; despite this, it’s still a remarkably effective independent film that's more effective than many of its low-budget brethern from the same time period. Besides its enthusiasm for the genre, the film’s biggest calling card is its surprisingly effective gore effects. It’s pretty easy to see where most of Raimi’s money was spent, as there are plenty of decapitations and disembowelments that could easily fit into a big budget horror film. The zombie designs themselves are also very well done, as there are a variety of gruesome designs to enjoy here. Besides this, the film manages to have a pretty creepy atmosphere, and Reverend Jones and his cult make for highly effective villains in the sense that they’re willing to do anything to protect the undead. The film’s score is also pretty good—it sounds like it might be stock music, but it was actually composed by Bookwalter himself, and it’s just another one of those low-budget elements that adds to the film’s charm. All told, The Dead Next Door is a worthy entry to the zombie genre. As far as ultra-low budget horror films go, one can certainly do worse than this one. 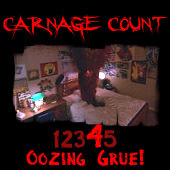 Gorehounds especially will want to track this one down, but I think zombie fans in general will want to give it a look. Anchor Bay has released the film on DVD, and the disc features a full-frame presentation (this is the film’s OAR, so don’t bother looking for a widescreen version) along with a 5.1 remix that’s surprisingly well done. 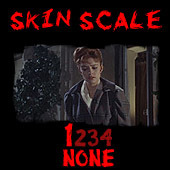 As far as the video goes, this flick is shot on Super 8, and the transfer often reflects that; however, there are some points where the film looks much better. Still, you won’t be grabbing this one off the shelf to show off your new HDTV or surround sound system. There are also several hours of extras, which is amazing when you consider the low-budget origins of the film. Here’s the bottom line: I wouldn’t be waiting for a better edition of The Dead Next Door to be released anytime soon because I can’t imagine it can get any better than this one. Even though it’s a low budget film with sometimes atrocious acting and overdubs that’s bound to turn off some people, I’m still going to recommend that zombie aficionados Buy it!